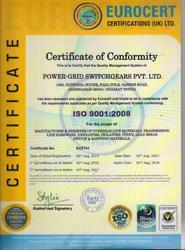 Since our commencement in the year 1995, we, “Power-Grid Switchgears Pvt. Ltd.”, are among the enviable organization, engaged in manufacturing and exporting a comprehensive range of Products. The range offered by us constitutes AB Switches, Drop Out fuses, Earthing Material, Porcelain Insulators etc. Our offered range is well-known in the market for their features like low maintenance, high tearing strength, lightweight, easy installation, high performance and high conductivity. Owing to the above-mentioned features, our offered range is demanded across electronic and engineering industries. Backed by a team of diligent and dexterous professionals, which is hired after rigorous assessment of their knowledge, we are able to accomplish our business related tasks in efficient manner. Owing to our team, we are able to meet the exact requirements of customers accordingly. Well-versed with the changing technological advancements, our team is capable of operating the machinery that is installed at our infrastructure facility. Our infrastructure is segregated by us into different departments that enable us to carry out a hassle-free production process. Owing to our honest business policies and state-of-the-art infrastructure facility, we have gained huge client-base. We have gained some major clients like Gujarat Electric Board, Ahmedabad, Gujarat, Electrical Contractor and HT Consumer, Ahmedabad, Gujarat and Electricity Company, Ahmedabad, Gujarat. Our products are exported to Dubai, Oman, Iraq, Mauritius, Congo, Nigeria, Mozambique, Zambia and Kenya. Under the guidance of our mentor, 'Mr. 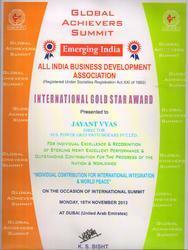 Jayant Vyas(CEO)', we are growing from strength to strength from over two decades. With his rich industry knowledge and expertise, we have gained numerous clients. Constructing a state-of-the-art infrastructure unit at our premises, we are able to manufacture, wholesale and export Safety Products. Spread across an extensive area of premises, our infrastructure aids us to complete the business operations in prominent manner. Equipped with ultra-modern tools and machines, our infrastructure assists us in meeting the bulk demands of customers. Additionally, proper segregation of infrastructure is done to carry out hassle-free production. Our team is the asset for our organization, owing to which we have been able to manufacture and exporter of Products. The team hired by us is experienced, talented and holds in-depth knowledge of this domain. Aware with the changing technological advancements, our team manufactures the entire range in accordance with the international quality standards. Further, our team works round the clock to accomplish the organizational goals in an efficient manner. Renowned in the industry as a manufacturer and exporter engaged in offering our clients with Products. We develop the entire range with the aid of modern machinery and technology, which enable us to meet the bulk demands of customers efficiently. Through customer orientation and excellence in quality, we have mustered huge client-base across the national and international markets.